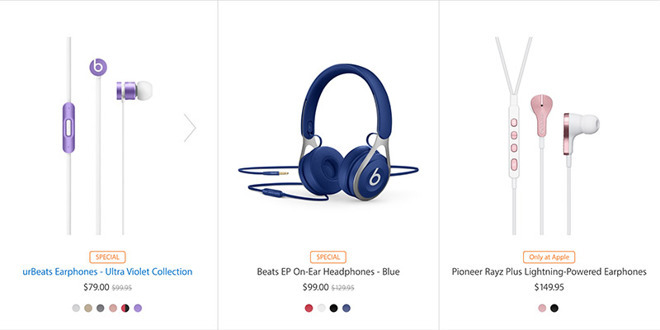 Apple on Monday updated its online storefront to reflect minor discounts on certain Beats products, including both in-ear and over-ear headphones, as well as the Beats Pill+ portable speaker. In particular, both the Beats Pill+ and Beats EP On-Ear Headphones get a $30 cut, dropping pricing down to $199 and $99, respectively. UrBeats Earphones also get a discount, with the in-ear devices dropping by $20 to sell at $79. The reduced pricing applies to all color options for each product, including (Product)Red models. For example, the $79 price tag applies to regular urBeats colors like silver, gold and Space Gray, as well as hues in the Ultra Violet Collection. Apple failed to announce the reduced pricing, but marks each product page as "Special." Terms and conditions detailed on the company's website note the promotion runs through Aug. 26 at 11:59:59 p.m. Pacific. With Apple discounting select Beats headphones and speakers, Apple authorized reseller B&H Photo has gone ahead and matched the discounts —but with no tax collected in 48 states. This saves many shoppers with addresses outside NY and NJ another $8 to $16 in tax compared to buying direct. And you won't have to wait long for your order as B&H is also throwing in free expedited shipping to the lower 48 with each Beats purchase. For deals on additional models, visit our Beats Price Guide.